EARLY in the nineteenth century, there was a famous Spanish tenor, named Garcia, a man of great ability and of a brutal temperament, artist to the tips of his fingers, and incomparable as a teacher. He had a son, who became a celebrated singing master in London, where his one hundredth birthday, was fittingly celebrated in March, 1905, and where he died on July 2, 1906. Among his numerous other children, Garcia had two daughters, one twenty years younger than the other, whom he fashioned and bullied and beat into rare artists. The elder was Malibran; the younger became Madame Viardot. Legouve, in his "Soixante ans de Souvenirs," gives us a very living portrait of Malibran, whom he first heard at a charity concert. Her reputation had preceded her, and the young artist, wife of an American merchant, was already looked upon as a possible rival to Mme. Pasta. She seemed a mere girl, and wore her hair very simply, in bandeaux. The mouth was large, the nose a little short, but the oval of the face was perfect and the eyes—wonderful eyes "that had an atmosphere"— reflected passion, or melancholy, or revery. Before she had finished the song of the willow in "Othello," the audience was wild with enthusiasm. Malibran's voice was not naturally sweet or pliable. It was made of hard metal that had to be forged with great labor. Her terrible father was a master blacksmith in such matters. Once, in New York, where Garcia and his daughter were engaged in the same opera company, Malibran saw that "Othello" was announced. She vowed that she was not prepared to sing the part of Desdemona, and that nothing would induce her to attempt it. Garcia replied: "You shall. And if you disgrace me, I will kill you in the last act." She did sing the part, and magnificently. But at the last scene she bit Othello's hand so cruelly that he cried out with pain. The audience, seeing in this an added touch of tragedy, applauded more frantically than ever. Such a father, such a daughter, could not long remain on very friendly terms. They separated, and for years saw nothing of each other. Toward the end of her life, however, Malibran sang once more with her father, at a representation of " Othello " given for the benefit of the old singer. He surpassed himself. Desdemona, at the close, embraced the smutty-faced Othello and bowed to the public, her cheeks smeared with black—and no one laughed. She was a woman of many moods, reckless and charming, fierce and gentle by turns. She fell madly in love with the Belgian violinist de Beriot, and obtained with great difficulty the annulment of her first marriage. To celebrate the second union, a party had assembled at a friend's house. Thalberg was among the guests. She asked him to play; he refused to do so before hearing her sing. She was not in the mood, and her voice sounded harsh and displeasing. As her mother reproached her for it, she exclaimed: "I can't help it, Mother—marriage only comes once in a lifetime!" She had quite forgotten her first matrimonial venture. Then, Thalberg sat down and played divinely. She pulled him off the stool, exclaiming, "Now I can sing!" and she put so much feeling, so much passion, in her singing that the guests were electrified. An odd marriage day, all the same! In all things Malibran was excessive, violent, imprudent, delightful. Her love of horses amounted to a passion, and really caused her premature death. Some months after she became Mme. de Beriot she went to London, insisted on riding a vicious horse, was thrown and badly hurt. She continued her engagement, however, and fainted at a concert. That was the beginning of the end. De ta joue amaigrie augmentaient la paleur? Et que e'est tenter Dieu que d'aimer la doulcur? One day, Legouvd met Malibran in the street and stopped for a moment's chat. A carriage went by and a gypsy-looking child, leaning half out of the window, threw kisses and waved her hand to the singer. "Who is that?" asked Legouve. "Some one who will be a greater artist than any one of us. My little sister, Pauline." When Malibran died, in 1836, Pauline was still a very young girl. She verified the prediction inasmuch as she became a great artist, even if she did not surpass her sister. She did not long remain on the stage. She married a very distinguished man, M. Louis Viardot, writer, critic, amateur, who made of his house a very museum of rare pictures and beautiful objects. His admiration for his gifted wife, his adoration of her, never wavered. He could never speak of her without a softening of the voice, a gleam of the eyes. When I became acquainted with Madame Viardot, she was close upon sixty years of age; to all intents and purposes she was still a young woman. The extraordinary vitality, the energy, the genius of this great artist showed in everything she did, in everything she said. It is not only in works of art, in music, in eloquence that genius reveals itself; it permeates all things, even trifles. Mme. Viardot could never have been handsome. The characteristic face, with its fine, rather near-sighted eyes, under heavy brows, the large mouth and somewhat cumbrous jaw, were strong, but not at all beautiful. After the first few minutes, no one felt this. The luminous expression, the intelligence of the woman, sufficed to fascinate, to carry away, to subjugate. To my thinking, the one word most fitted to Mme. Viardot is intelligence. She was not only a great singer, a great artist, she was extraordinarily cultivated. Mistress of five or six languages, speaking each one almost without accent, she was conversant with the literature of many countries. One evening I remember that in her salon, which was a very cosmopolitan one, she turned, within five minutes, to several guests, speaking to all in their own language, Spanish, Russian, English, Italian, with perfect ease and fluency. The Viardot salon, however interesting, in no way recalled those of the seventeenth and eighteenth centuries, which in France so influenced the thought of the nation. Modern salons are as unlike these as the leading members of society differ from Mme. de SeVigne or Mme. du Deffand. Material conditions of life are entirely changed. The aristocratic hotels of olden times —solemn and quiet—showed large and lofty rooms, difficult to heat, with nooks sheltered by screens, and deep window recesses well fitted for confidential talks. The guests were chosen with care, they were not very numerous, and were always the same. A conversation begun one week around the supper table, or at the fireside, could be leisurely continued eight days later. Like a homogeneous company of good actors, each one knew the "manner" of his fellows and adapted his own to it. All did not seek to shine at the same time, each knowing that his turn would come, according to the sweet will of the all-powerful hostess. Not that Mme. du Deffand or her predecessors, like a lady whom I knew, distributed "subjects" to her guests, and assigned so many minutes to each for the discussing of them. On one occasion, Renan having opened his mouth to speak, his hostess lifted her hand: "Presently, cher Maitre, your turn comes next." Then, when his turn did come, the great man said modestly: "I merely wished to observe that the peas were very good, and that I should have liked more. It is too late now." Now let us picture to ourselves the modern French apartment or even house. Comfort, unknown to former ages, reigns supreme. Well heated, brilliantly lighted, dainty in its decoration, beautifully furnished (often a little encumbered), with light-toned pictures on the walls and a statuette on the mantel piece, where the oldfashioned clock used to tick, the modern lodging is too small to hold the number of guests convened to reception or ball. Society has enlarged in proportion as the salons have, materially, dwindled. Every one aspires to belong to the monde. Crowds invade the suite of small rooms. The women are provided with seats, huddled together, forming a compact and formidable mass of gay silks, bare shoulders, glittering jewels and fluttering fans. The men go where they can, stand by the doors, against the walls, in far-off libraries or even bedrooms opened for the occasion; most willingly do they take refuge in the host's smoking den, where they sit at ease, drink beer and discuss politics—or women. What "conversation" of any interest can result from this absolute separation of the sexes? How can a hostess dissipate the ennui of the few hours which are supposed to be devoted to pleasure? The women hide their yawns behind their fans, or try a little small talk with chance neighbors, often quite unknown. Almost inevitably the reception changes its character: becomes a concert; sometimes a little play or some monologues take the place of the music. The actors are not always of the best, and they are seen from too near to admit of any illusion. Such mild pleasures scarcely compensate for the tedious waiting and the cramped position. And this is the outcome of that wonderful society celebrated for its wit, with whom conversation was an art, where madrigals or epigrams were chiselled like jewels! Of course, there are exceptions. But the only reunions, perhaps, where wit still holds its own, are the dinner parties, where the hostess is careful not to pit one great man against another, to have one planet only, surrounded by discreetly twinkling satellites. Mme. Viardot's salon was essentially musical. The house an old-fashioned one— stood in the Rue de Douai, at a corner which, by the position of the cross street, formed a rather sharp angle: here a few shrubs were planted. M. Viardot had added to the original building a picture-gallery, a delightful room, a step or two lower than the salon. Here, many of the musiclovers, the men especially, congregated. The drawing-room was not very large, and the piano took up a great deal of space. Once ensconced in a chair, there was not much chance of moving before the end of the evening. But here there was plenty to amuse one. The aspect of the assemblage was interesting. Mme. Viardot did her best to dispose her guests so that they might find themselves in congenial surroundings. Huddled in a corner behind the piano were her favored pupils, who were to sing, or merely to listen. In the central armchair, always placed in exactly the- same corner, was enthroned an odd-looking woman, to whom all seemed to pay homage. This was the Comtesse d'Haussonville, mother of the present Academician. In her youth she had been painted by Ingres, in the stiff costume of the time and the inevitable scarf. She still wore her hair (or was it a wig?) in bandeaux and her gown kept the rigid folds of 1830, or thereabouts. Mme. d'Haussonville had been a power in her day, very intelligent, very domineering and very fond of music. In her old age she never missed a Viardot reception, and, though she invariably slept after the first piece or two, her nods, of the Olympian kind, passed for signs of approbation. Renan was another faithful guest. His love of music amounted to a passion. Probably it accompanied fitly his philosophical dreams, which had nothing in common with those of Mme. d'Haussonville. His subtle, wavering, far-reaching thoughts, like music itself, went beyond the domain of mere words. He was, however, not a particularly poetic-looking person. His broad, shaven face, so like that of a good cur6 de campagne, is too well known to need description. What is less known is his beatified expression when a beautiful voice or the exquisite strains of a violin filled the air. His big, fleshy, sensuous nose, his overhanging cheeks, his half-closed eyes revealed the inner joy and transfigured the man. Deeply sunk in his armchair, usually placed in the picture gallery, his episcopal-looking hands crossed on his bulging person, he could have sat as the very image of fat content. Renan was exquisitely courteous, with something of priestly unction in his manner. He greeted his daughter's partners at a ball with as much elaborate politeness as the distinguished strangers, or his fellow Academicians, who crowded about him. To tell the truth, from the heights he had attained, as from some great mountain-top, all men seemed to him about on the same level. The differences were so small! In her salon, M. de Beriot could always be seen near his aunt. He seemed at least as old as she, dried up, gray, dusty-looking. M. de Beriot, professor at the Conservatoire, was an impeccable pianist, who gave but little pleasure. His interminable sonatas were somewhat dreaded. One could but wonder that Malibran, that marvel, that creature of fire, of passion, of tenderness, could have been mother to so correct, so impassive a being. There was another man who hovered about the genial hostess, a very tall man, very handsome, whitehaired, white-bearded: this was Tourguéneff. He was the intimate friend of the family; he lived in the house, having his set of rooms on the third floor; he spoiled the children, helped M.Viardot to ferret out hidden treasures, and listened in wrapt delight when Mme. Viardot sang. Tourguéneff, though not exactly an exile from Russia, was looked upon with much disfavor by the authorities of his country, and lived in France, loving it, pitying it after its disasters, speaking its language with perfect purity, only a little more slowly perhaps than the glib-tongued natives. He did not attempt to translate his books himself, which he might have done with perfect ease. One of his most intelligent and devoted translators was a woman, then quite unknown, who had spent a great part of her youth in Russia, and who, somewhere about 1875, became famous under the name of Henri Greville. The Russian's books scarcely reached the great mass of French readers, but they were greatly admired by men of letters. Alphonse Daudet, little versed in foreign literatures, yet delighted in Tourguéneff's stories and sketches. In a paper written for the Century Magazine, in 1880, he painted a very vivid portrait of Tourguéneff. The two novelists met in Flaubert's pretty apartment overlooking the Pare Monceau; they became friends almost at once. At Flaubert's little dinners, Tourguéneff's place was always set: the guests were almost invariably Zola, Daudet and the Russian. Each in turn would bring his latest work, read a chapter, listen to friendly but frank criticisms. The dinner began at seven o'clock, and ended somewhere in the small hours. After the death of Flaubert these dinners no longer took place; no one had the heart to play host when the bigvoiced, big-hearted man was laid in his Normandy grave. But Daudet went to see the "good giant" at the house in the rue de Douai, or at Bougival; and, when he was well enough, Tourguéneff was a frequent and most welcome guest at the home of Alphonse Daudet. Then the visits became fewer; the Russian suffered great agonies before death came as a relief. He and his friend Viardot passed away during the same sunny, summer days. Doing the honors of their mother's salon, in those far-off days, were two charming daughters, one Mme. Chamerot, the other, who has since become Mme. Alphonse Duvernoy, still a young girl. They were handsome, sweet-mannered, and had been trained by their mother. Neither possessed an exceptional voice; both sang delightfully, and a duet by "les petites Viardot," as they were then called, was a real treat—the method was so admirable, and the two pretty voices blended sp perfectly! All the foreign musicians who went to Paris were sure to be welcomed to this hospitable house, and much native talent was there first manifested. To be proclaimed an artist by Mme. Viardot was already a title to fame. It was there that I first heard M. Hasselmans, the most wonderful of harpists. He was then young, with light brown hair and beard, remarkably good-looking. In spite of his unusual height, he handled his instrument with perfect ease and grace. To hear a prelude of Chopin played by him was a revelation. But it was when Mme. Viardot herself consented to sing, which did not often happen, that her guests were really content. To use the artistic jargon, there were "holes in her voice," and no one knew it better than she—but who thought of any flaw in the instrument? The great artist carried her hearers away with her in a whirlwind of passion, of sentiment, of horror, or pity. Music with her, as it had been with her sister, was alive, vibrating, all conquering. One evening she sang "The Erl-King." At the end, there was a moment of absolute silence before the frenzied applause broke out. After the music, when the chairs were pushed aside and sympathetic groups were formed in corners or around the tea-table, Mme. 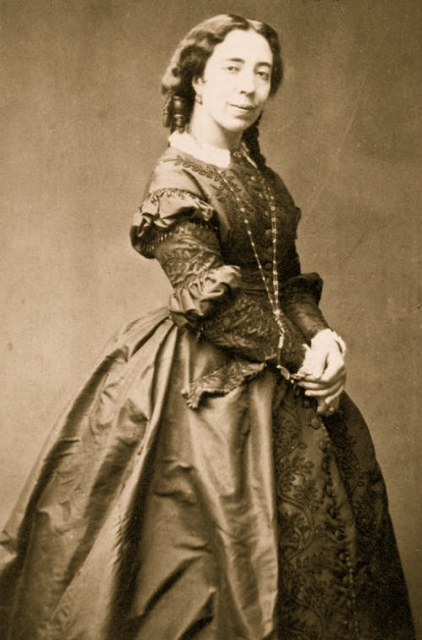 Viardot's powerful personality still pervaded the assembly; her cordiality, her genuine pleasure at seeing so many friends about her, made us all feel at home; in her presence, all seemed more cordial, more human than elsewhere. And so her salon was a real centre, a social as well as intellectual and musical centre. On one occasion, some years after we had made her acquaintance, Mme. Viardot invited us to dine at her country place. Toward the end of a lovely summer afternoon we went to Bougival, and sat with our hostess on the terrace. The garden sloped down rather abruptly to the road, on the other side of which flowed the beautiful Seine. Behind the house, climbing up to the hill-top was a park, a real wood, left a little wild. At the edge of it stood a chalet, occupied by Tourguéneff. We talked of many things, of many lands. She seemed peacefully happy and content, as simple as truly great people always are. She amused us with the tricks of a big white poodle, that went through his varied exercises for our benefit: he spelled out my name; then, his mistress giving him the pitch, he howled in tune and in measure. In the course of conversation the artistic temperament was discussed, that peculiar double nature which can, while subjected to strong emotions, yet analyze its best—or worst— impulses. On one occasion, a favorite brother of Mme. Viardot's broke his arm; the setting of it was horribly painful. At one moment a terrible cry shook the listening sister to the very depths of her nature— yet she caught herself thinking: "If only, on the stage, I could utter such a cry!" The evening was delightful; the men came in, and the daughters, with their husbands, were of the party. I noticed that at the Russian's place at table a huge drinking goblet was set, as though everything belonging to him had to be unusual and very big. He told us of his life in Russia, of his long tramps through woods and fields, from which came the inspiration of his hunter's stories. Once his vanity had been sorely hurt. He had grown gray, then white, when still quite young. After a long hunting expedition, he had thrown himself on the ground and had gone to sleep. A peasant going by roughly shook him, saying: "Are you not ashamed of yourself— an old man like you—to lie there, drunk?" He added: "I was not drunk, and I was not old; but I meekly got up and went my way." M. Viardot, who had taken a great fancy to my husband, not infrequently came to our house, and the discussions between the two men were long and interesting. When M. Viardot died, his widow, with a touching note, sent us a pretty bronze that used to stand on the dead man's desk; she said, "He was very fond of you." Mme. Viardot is now a very old woman, but she still teaches, she still composes, and with real talent; she still assembles friends about her. Her eyes are dimmed, her hearing no longer good, but the ardent soul is still bright within her and her affections very keen and warm. Her children, grandchildren, great-grandchildren surround her with love and care. But she lives alone, except for the faithful company of a lady friend who from time immemorial has been her factotum. The old house, Rue de Douai, was torn down many years ago. Mme. Viardot now occupies a beautiful apartment with a rounded balcony at the corner of the Boulevard Saint Germain, overlooking the Seine, the Place de la Concorde and the Tuileries gardens. The most lovely part of Paris is at her feet, as was the world, in the days of her triumph.